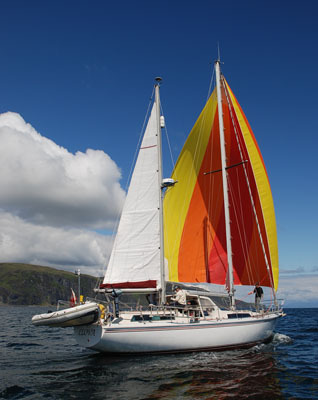 Welcome to Argyll Yacht Charters providers of quality bareboat or skippered yacht charter and sailing holidays from our base at Ardfern on Scotland's magnificent West Coast. We provide the opportunity for you to discover over the course of a sailing holiday the beautiful coastline of Scotland on board one of our yacht charter boats. Visit the Western Isles, explore the sea lochs or voyage to the Outer Hebrides, St Kilda, Orkney, Ireland or as far afield as the Faroes - whatever your aims we have a suitable boat. Through our yacht charter service you will see world class scenery and seascapes that can only be found in Scotland, complimented by a rich variety of heritage and culture, wildlife, superb cuisine and of course the world famous distilleries, many of which can be approached from the sea. Take a look at our range of yacht charter boats. From a compact Jeanneau 32 to a more spacious Amel ketch and a brand new Elan 444, and then contact us to enquire about availability or any other questions you may have relating to yacht charter.